With all of the uncertainty in today’s world many people are trying to become more self sufficient. Growing their own vegetables, raising their own chickens for eggs, or raising bigger animals like beef and dairy cattle if they have the room. The more self sufficient are even making their own clothes and/or other household items, including building their own homes and even furnishing them with handmade furniture. Many of those people, those who desire to be off the grid, must find ways to power their homes without relying on the power company. Some, like the Amish for example, may choose not to use the modern convenience of electricity and so they use lanterns and work horses and the like to meet their needs. But there’s no arguing that modern appliances and power tools make life easier, so for many self sufficient folks the only logical answer is to create their own electricity at home. This can be accomplished a couple of ways. One way would be to purchase somewhat expensive solar panels to utilize the power of the sun. Another way would be to spend thousands of dollars on a generator which can be used on its own or in conjunction with the aforementioned solar panels. But why buy one when you can build your own generator? The average American is accustomed to a house power service that provides 110v ac to run basic electronics like the lights, television, computer, or refrigerator, and 220v ac to run their stove and clothes dryer. But if you’re living off the grid and doing so on a budget consider that you can run your house lighting system on a 12v circuit with battery backup simply by using automotive alternators and batteries (actually deep cycle marine batteries work better) with 12v lights. This lessens the demand for power and in the event of a failure of a gas powered generator or inability to obtain fuel you can still run your house off of the batteries, and by supplementing the system with solar power and a wind generator built with an automotive alternator (or similar) you can keep the batteries charged to run the 12v lights and power inverter(s). This 12v system can still run a refrigerator or stove simply by using a step up transformer commonly known as a power inverter or you can use the 12v system to power a 12v motor to turn an entirely independent generator system with a higher voltage output if you can source that free rather than spend several hundred dollars on inverters. Automotive alternators can supposedly be reconfigured to generate 110v. Another method you can find readily online to generate 110v is by using a110v motor like the one from a furnace or even a dryer or ceiling fan motor. Normally, if you introduce electricity into the motor it becomes kinetic energy and turns the motor, but if you reverse this process and use an outside force to turn the motor, it generates electricity, or at least that’s the story that can be found online. I’ve never really tried either of those two methods but it’s something to explore. However I can say with 100% certainty that a 12v generator system with a battery bank and power inverter can run 110v home electronics reasonably well. 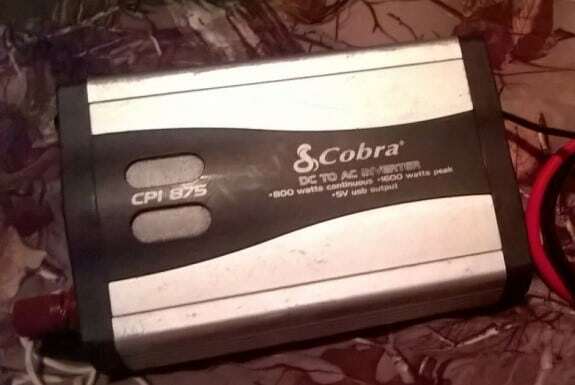 I use an 800 watt converter for camping and hunting trips (pictured below) but if you want to use this method to continuously run your home you will need a substantial converter in the 4000-5000 watt range, although a 1000 watt will run the refrigerator, television, and several lights as can be seen in this youtube video. Another method of running your house off of a homemade generator setup involves a bank of batteries, power inverter(s), and using automotive alternators in a small backyard windmill or other power source like a lawn mower engine to turn the alternator. An example of a12v generator built with a lawnmower style engine can be seen here. This setup utilizes the wind or other power source to maintain the battery charge and the batteries power the inverter(s), which in turn power your electronic equipment. Here is an example of a windmill using an automotive alternator. In some of these videos, people say they bought new components but that defeats the purpose of self sufficiency. Using found parts, or buying a used mower engine is closer to home. There are tons of videos on how to do this but I’m not sure I want to try that, I’ll buy an inverter. Once you have your battery bank setup with the alternator charging system of your choice it is now just a matter of hooking up the power inverter. You can hook the inverter directly into your main breaker box if you want to (just make sure it is not on any outside power grid). An electrical supply for a small house is usually a 100 amp service but a larger home will require more. Newer houses, built in the 1970’s and up will utilize a breaker box, these look like switches. Older house service panels utilize fuses, this is similar to a breaker but when a fuse blows it is done, when a breaker trips you simply turn it all the way to the off position then back to on and service is restored. The breaker box on your house has a 220v feed coming into it, this is then split into two banks of 110v power. This is where you see the breaker switches that you use for each circuit in the house. For example, there are likely several narrow 15amp breakers that go to house lighting and wall outlets, and a 20amp breaker for the refrigerator. These are single pole breakers and are used for 110v only. You will also see a bigger, wider, double breaker in 30 or 50 amp, these are for the dryer (30) and stove (50). These circuits require 220v. 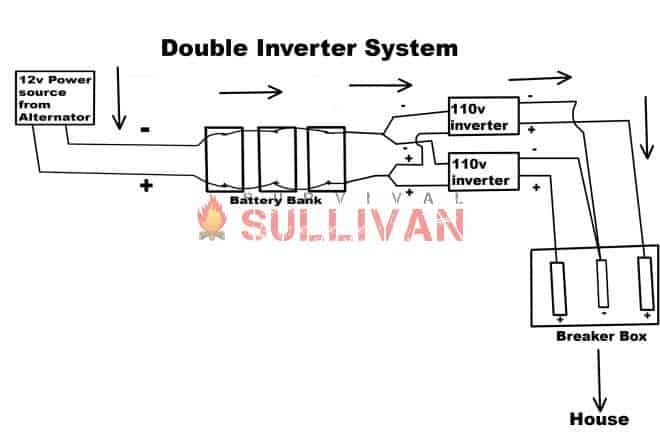 If you can wire it directly to the feed side of the breaker box since the inverter is only 110v, in order to get 220v you will need to wire 110v from the inverter to BOTH sides of the breaker box (black wires in diagram below), the breaker box will then divide the power among the circuits accordingly just like if you were on a power grid. The diagrams above show how to wire the system, starting with the 12v generator made with the automotive alternator, going to the battery bank to keep it charged. This battery bank in turn supplies the needed 12v input for the 110v inverter(s) which can then be wired directly into the house breaker box. Again, make sure the house is NOT on a power grid. You can usually tell because there will be a glass globe meter on the house where the supply enters. If there is no globe it is probably safe to go ahead and wire into the box. You will need to take the service panel off the front of the breaker box to access this. If using a single larger 110v inverter (4000-5000watt) you will have to split the positive (+) into two leads and wire each side of the breaker box, if using two smaller inverters (2000-3000) run the negative (-) from each to the center buss (common ground buss, there will be bare copper wire bunched up along this buss bar) and then run the positive from each inverter to one side of the box. This will provide power to the entire house. If you really want to make sure you get plenty of power run two large inverters, again, depending on what’s available, this is a best case scenario. New deep cycle batteries aren’t cheap but if you can afford them you will have better results, just like if you use two large inverters. But if you’re on a budget “found” car batteries and smaller inverters will still work, you just may not be able to use the stove or dryer. A smaller hot plate that runs on 110v can be substituted for a full sized stove if you can’t or don’t want to provide enough power to run a 220v circuit for the stove. Now having thoroughly confused you, let’s just take a quick overview on how to actually make the generator. Tools (wrenches, drill, drill bits, etc. )*NOTE: If you need the generator to have electricity then you obviously can’t use a power drill. I advise to find an old style hand drill; flea markets are often a good source for older tools like this. Add the battery to the device and attach the positive and negative cables to the appropriate terminals on the battery. This will allow the generator to work for several hours without running the engine. This battery can also be used to start the engine. Add the 12v dc to 110v ac power inverter(s), connect leads from the battery and connect power output leads. This can be wired directly into the breaker box as discussed in the article or you can simply put a cord with outlets if the generator is intended to be used portably. Being self sufficient is becoming more important these days and it’s far better to be so than to rely on someone to come and save you. Think back to times when severe storms left many people stranded and without power for days or even weeks. Several years ago we experienced a severe ice storm that knocked every ones power out in the rural area we lived. I simply got my generator out and hooked up the refrigerator, microwave, several lights, space heater and the television. To my surprise the cable still worked! Everyone that drove by stopped and asked about the power and I told them, nope, it’s still off, I have a generator. The information here can be utilized for temporary emergencies such as a power outage due to a storm, to set up your hunting lodge or summer home on the cheap, or to power your permanent home if you chose to do that. With items you can scrounge or with a minimum initial investment and using your brain you can make your home power source for yourself. This information is intended to show you that it’s possible to do with just a little ingenuity. Warning! Making your own generator can be dangerous. The contents of this article is for information purposes only, and should NOT be mistaken for professional advice. 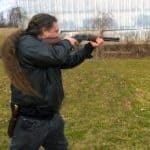 Neither the author, nor www.SurvivalSullivan.com shall be held accountable by the use of the advice presented in this article. We highly recommend you seek expert advice if you’re looking to do this project. For your home-made genset, why use a puny car alternator? Instead, go to a heavy truck supplier for a massive alternator engineered for constant duty. 200-amps constant duty instead of 60-amps intermittent duty. Instead of a 10-horsepower lawn-mower engine, use a diesel engine from a wrecked truck. But… all this seems a duplication of the power-plant sitting in your driveway. If you can get one free that’s a great idea, but if you have to buy it it costs as much as a small generator. In this set up the alternator is only to charge the battery, and the battery is to run the power inverter. The point of the article is utilizing found materials, if you have $1200 you can buy a real generator. food for thought . ordinary electric motors won’t work as generators, it takes a special motor to make it work ,I don’t remember the type at this time .also a sinus rotor would be better to run the alternator ,it is self governing ,runs at lower wind speeds, don’t need a special high tower and can be constructed at home two barrels , a wood frame, two pulleys ,long belt and associated wiring . produces 12 or 24 volts depending on alternator . a recreational refrig would be a good alternative – from a recycled camper or a 12 v refrigerator. recycled truck batteries would be another consideration as it takes a lot of power to use a regular frige – remember it takes three or four times the running current to start the motor that it takes to keep it going . Thanks for your input, this might not be the exact perfect scenario, its an example of utilizing the materials around you. B freakin’ S!!! NO ONE is cooking on a 220V electric stove using an alternator for power. c’mon sheeple..do a little research…you’d be better served with a small backyard grill..wow! what people will believe!! Again the alternator is only to charge the battery, the battery powers the inverter which si where the Ac voltage comes from. Hundreds if not thousands of videos shows this works including videos in the article showing him running a fridge. its not magic…or is it? What about using a three cylinder Detroit diesel engine to power your engine, you can also buy # 2 diesel fuel for your engine and it is a lot safer than gas. Would recommend leaving it outside as the fuel would make your garage smell of the fuel and also make you sick of the fumes. The engine would have more power as every time the piston goes down being a two cycle engine, you will be on a power stroke, a lot of power even in idle. Yes, that would surely work. Thank you for your positive input. There are many ways to turn the alternator, there are videos on youtube showing windmills and waterwheels to turn the alternator. The idea is to think and utilize what you have on hand. And this shows you are thinking. Cool. This is just information to get you thinking, there is a lot of information on youtube. I even saw one where they used an exercise bike to power the alternator. This reminds me of the Vietnam era field radios used by the VC. Thank you for you positive input.